See Scooter Singh drive through Southall. Economy cuts as Southall Post Office? The Post Office on Southall Broadways gives the impression that it is cutting costs. It's a bad idea to walk into the main Post office on Southall Broadway, after a Bank Holiday, as it might be very busy. Surely the rush would be over by the late afternoon. No so. It has always had a single orderly queue but today it was very confusing.queues half way down. Not very surprising when you have a lot of Asians involved! There is the marked and official old queue and another dodgy one being created half way down. Which one do I follow? The other one if for express deliveries? No, it is for the car road tax people? Surely, the people behind the counters realise there might be a problem? Next person for desk 7, please. "Oi, I am next. Don't you know there is a queue?" "But I am in the queue." What is the fuss/mess all about? A few minutes later, a Post office person comes out to sort things out. There are 8 possible counters but counter 6 is for special deliveries and road tax queries. See, it has notice on it, the official explains. It has its own queue but there are no signs to say so. People are supposed to work it for themselves or be good at mind reading. You would expect this counter to be on one side but that would be asking too much. I can only guess that blocking service counters by a secondary queue is more sensible according to the Post Office think tank. Only 2 stupid mistakes? No. It was hot and humid inside. There were a lot of people aswell. There were a lot of fans in the post Office but no one bothered to turn one ON. Can't be bothered to turn on the fans on a hot and humid day. Can't be bothered to put up a sign to say there are 2 queues and why? Very uncaring, stressful and time wasting experience. Just like a car visit to Ealing Hospital. Need to cough up a minimum of £3.50 for the privilege. 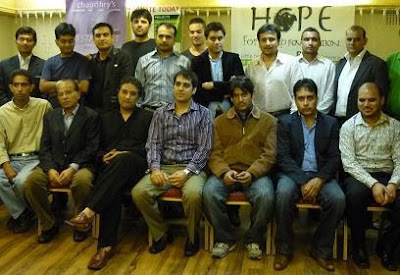 The Hopes for Help Foundation charity holds fund raising dinner in support of the Pakistan flood victims in Southall. The charity iftari dinner was held on Sunday 22nd March 2010 at 8pm in Chaudhry's TKC restaurant on Southall Broadway. The entry donation was £25 per person which can provide a food package for a family. Dalawar Chaudhry contributed to the appeal which meant that the actual cost of the dinner would be virtually free. A person who has been to the affected areas said that a family was lucky to have a tent with a single manji (bed) in it. Food was something else. You would go out in the middle of the night to ensure that you have everything for breakfast. These people have nothing, have had nothing for weeks, so you can understand their despair and frustration and need to feed their family. The cricket ball with which Amir Khan claimed 5 wickets to win the recent 3rd Test match against England was auctioned for £200. 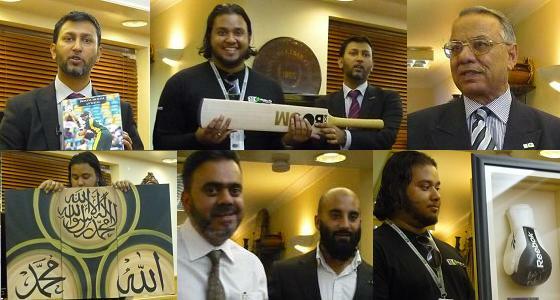 A genuine BOOM cricket bat signed by Pakistani cricketers was auctioned for £300. A photograph of Imran Khan claiming his 500th test wicket, which hung in Imran Khan's home, was also auctioned. Pakistan is still ruled by illiterate feudal lords. They don't understand that it is their job to serve the people and the country. They are not prepared to get their hands diry to help the people. Rather than complaining that some one is not doing their job properly, middle class individuals should stand up and offer their skills in their specific field, for the betterment of Pakistan. Choose any route you like but do something. We need to bring change in Pakistan. I have never felt at ease at asking for money. But for the sake of the flood victims of Pakistan, I have no hesitation in getting my nose dirty, knowing that even £2 would mean a lot to some poor souls in Pakistan. For Pakistan flood victims - 1,600 killed and an estimated 20 million people affected by the worst floods in Pakistan's history. Kiya Jis ne﻿ gila.... Mili aur saza = one who complaint ..Got more punishment. The charity Muslim Aid organised a fundraising dinner on in Southall in support of the flood victims of Pakistan. 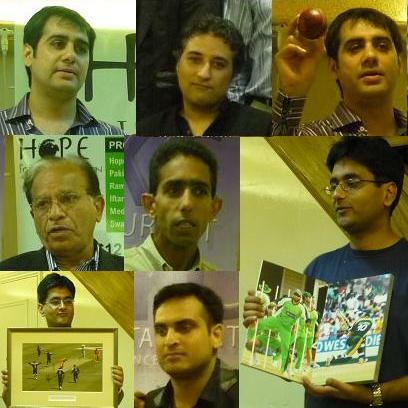 The fundraising dinner was held on Thursday 5th August 2010 at 7pm at Chaudhry’s TKC restaurant on Southall Broadway. Cricket players Azhar Mahmood, Saqlain Mushtaq, Abdur Razzaq and other members of the Pakistan Cricket team were expected to attend to show their support on the night but were unable to do so. One reason was the surprise visit by Pakistan president Asif Ali Zardari to the Pakistan cricket team. The other being that it was the eve of the 2nd Test match against England in Birmingham - a long way to travel on the eve of a match. The host for the evening was barrister Rizwan Hussain of Islam Channel. "For Muslims life is test. The real test is on those who survived or were unaffected. £155 will feed a (large) family (including grandparents) for a month. In the auction, the motto was to think about bidding against yourself and think about what your bid could do for the flood victims and not about the item itself. A Shahid Afridi's bat, to be signed, was auctioned for £400. Amir Khan's signed boxing glove was auctioned for £651. The Abubakr mosque, next door, has made and continues to make 100% effort in raising funds for the Pakistan flood victims but it will distribute the money collected using it's own people, as in previous cases. Southall Broadway Forum meeting reveals that plans for a biofuel power station in Southall were rejected by the Government. At the last Southall Broadway Forum meeting on Wednesday 30 June 20120 Councillor Zahida Abbas Noori revealed that she had received information that the plans for a biofuel power station in Southall were rejected by the Government. Last September Ealing Council turned down the planning application from Blue NG for the power station due to air pollution and road safety concerns. Blue NG appealed the decision and the secretary of state referred the application to a full enquiry. The two week hearing was conducted earlier this year. Israel's leaders sent helicopters of armed commandos to raid a convoy of ships in international waters bringing medicine and humanitarian supplies to Gaza, killing nine of them and wounding at least 30 people. Israeli Defence Minister Ehud Barak said "We live in the Middle East, in a place where there is no mercy for the weak." There is none shown to the Palestinians, especially the 1.5 million caged in Gaza. Israeli PM Benjamin Netanyahu says Israel had "no other choice" but to stop the flotilla of ships which tried to break the Gaza blockade. The Israeli blockade allows about 15,000 tonnes of humanitarian aid into Gaza every week. The UN says this is less than a quarter of what is needed. A columnist in the Ha'aretz newspaper wrote to his fellow Israelis, "We are no longer defending Israel. We are now defending the siege” of Gaza. The UN, EU, and nearly every other government and multilateral organization have called on Israel to lift the blockade. It's time for Israel to comply with international law and end the siege of Gaza. The Israeli blockade and the violence used to defend it, poisons the dream of two free and viable states, Israel and Palestine. Do you know which councillor in the London Borough of Ealing got the most votes? It was a councilor from Southall. Zahida Abbas Noori, the Labour Party Candidate in the Southall Broadway ward, got re-elected with 3947 votes. Her labour colleagues, in the same Southall Broadway ward, were not far behind. M.Shahid Kauser got 3788 votes. Surinder Nath Varma got 3715 votes. One short and annoying bus lane in Southall is in front of the Southall train station. There used to a sign indicationg the hours of operations but this has recently disappeared. No sign on a bus lane means that is operational all the time and cannot be used by motorists. The reality is that "the northbound bus lane on South Road, Southall" has been suspended by Ealing Council to improve traffic flow. You would only have known about this if you attended the Southall broadway ward a week ago or read the recent council press release about easing congestion. According to US Defence Secretary Robert Gates Al-Qaeda is trying to provoke war between India and Pakistan, to destabilise the whole of South Asia. Mr Gates praised his hosts for the restraint shown by India in the aftermath of the Mumbai (Bombay) massacre in November 2008. He went on to say "It is not unreasonable to assume Indian patience would be limited were there another attack." A wise man would have urged restraint. A war monger would not find war as "unreasonable". Who wants to destablise the region? How many deadly massacres have taken place in Pakistan? Is Iraq any safer or better after years of US occupation? No. Is Afghanistan any safer or better after years of US occupation? No. This is because the occupation forces are NOT interested in reconcilation between the citizens of those countries but dividing them. The Post Office on Southall Broadway is big, widely used and usually provides efficient service. But today, the service was atrocious. Popped in around 1 pm to find the queues reaching the front door and came back. Popped in around 3.20 pm to find the queues reaching the front door and came back. Popped in around 4.08 pm to find the queues reaching the front door and joined it. Only 3 to 4 of the 8 counters were open at any given time. How long would it take to get served? Why is it taking 32 minutes to reach a counter? "Because 3 of the staff are sick (long term). Even, I am not supposed to be here today!" And not a single bleeding "Customer feedback" form in sight. Ealing Hospital welcomed John Sergeant on Thursday 17 December to ‘officially’ open the CT Scanner and Digital Room at Ealing Hospital NHS Trust in Southall. Mr Sergeant had an illustrious BBC career spanning three decades, as well as being ITN’s political editor prior to his retirement in 2003. Last year he was a Strictly Come Dancing! contestant. Mr Sergeant was introduced to members of the radiology team and met some of the patients. Dr Miranda Harvie, consultant radiologist and project lead for the CT build, showed Mr Sergeant the state-of-the-art scanning machine – only the second of its kind in a London hospital. The scanner scans so fast that the whole abdomen is imaged in 8 seconds, obtaining 128 pictures per rotation and rotating 3 times per second. Images are exquisitely detailed for high quality diagnostic imaging and use a lower radiation dose than similar machines. It is used throughout the day for the Emergency Department, and Inpatient and Outpatient scanning. Such machines are complex and demand a high level of knowledge and skill to operate safely and competently. Dr Harvie said: "It is wonderful to have the opportunity to show Mr Sergeant and other colleagues the excellent work of the team and the sophistication of our technology to support patient care. Radiology is a fascinating area to work in, as it is constantly evolving. We have seen a significant increase in throughput and efficiency with this new scanner." Her colleague, Dr Akkib Rafique, also showed Mr Sergeant the digital x-ray room. The equipment can be operated remotely allowing the radiographer to be in the room with the patient at all times, which can be reassuring during such procedures. The new CT scanning and digital x-ray facilities were a £1.5m investment. The cold weather has caused numerous problems to residents of Southall. Some schools in southall were closed on Thursday and some on Friday. others schools were sending children home earlier. It was so cold that some people had problems opening their car doors. Even the bin lids were refusing to open to put rubbish in. The pavement on most roads were covered with ice, such that many people resorted to walking on the roads, making life more difficult for drivers. Even the roads around schools were not gritted. The number of people out and about was significantly reduced, as was the number of people eating in the local restaurants.